Whether you are looking for a self-guided Malaysia tour or want to join a guided tour of Malaysia, you will find a tour to suit your needs here. Click below to find some of the best guided and self-guided Malaysia tours available today. Many of these Malaysia tour packages feature unique Malaysia tour opportunities that you will not find anywhere else. Malaysia - Order FREE Travel Brochure!. Malaysia (Footprint Travel Guide S.) Tour Malaysia. From the highest heights of capital city Kuala Lumpur's Petronas Towers, all 88-storeys of them, to the perfect white sand beaches, coral reefs and national parks, Footprint Malaysia traverses the South China Sea guiding travellers to the most authentic experiences, and a little luxury along the way. Including Singapore, on the tip of Peninsular Malaysia, hundreds of off-shore islands, Eastern Malaysia, with its Orang Utan Sanctuary, Sabah and Sarawak. This in-depth and fully researched and updated guide also includes a comprehensive background section with food glossaries for Malaysia and Singapore, plus Malaysian words and phrases and 'Manglish', Malaysian English, to introduce you to its rich and diverse culture. 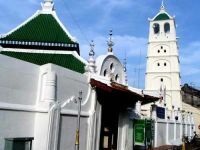 Malaysia Insight Guide (Insight Guides S.) Tour Malaysia. This 420-page guide to Malaysia gives a highlighted tour of the whole country, cross-referenced with detailed maps; plus, features covering aspects of the country's life and culture ranging from high-rise Petronas Twin Towers to Sarawakian long houses. A comprehensive travel tips section at the back of the book is packed with essential contact addresses and numbers. Features include: Places, region-by-region gazetteer section, with top attractions highlighted and cross-referenced with detailed local maps; Essay Features, incisive essays on Malaysia's history, people and culture; and Travel Tips, practical listings section, including accommodation, entertainment, transport and essential contact addresses and numbers. It also includes hundreds of full-colour photographs and 19 maps. Frommer's Singapore and Malaysia (Frommer's S.) Tour Malaysia. Discover two of Asia's most intriguing destinations. Our author has scoured every inch of this region, and she'll share her cultural insights and favorite discoveries with you. Her guide is much more complete and in-depth than its major competitor. In Singapore, you'll find the best places to stay, from high-tech business hotels to affordable finds, plus an amazing array of dining choices. Follow our author's fantastic walking tours, which introduce you to hidden gems in each ethnic neighborhood, you'll find Hindu and Buddhist temples and Islamic mosques mixed in with modern high-rises, colonial architecture, and even a real-live rain forest still growing at the edge of the urban area. In Malaysia, we'll take you beyond bustling Kuala Lumpur to discover beach resorts; the colonial architecture and amazing dining scene in Penang; idyllic islands; traditional villages; and great opportunities to shop for Malaysian handcrafts. We'll even visit Borneo, where rivers meander through dense tropical rain forests, beaches stretch for miles, and caves snake on for miles. In the many national parks that protect this spectacular jungle, you'll meet tiny deer, tinier owls, monkeys, and the increasingly rare orangutan. Experience all the adventure with Frommer's in hand, knowing you can rely on us for accurate information, practical advice, and useful maps.